The Gauls possess a vast and complex body of knowledge (disciplina)—knowledge about the gods, the soul, cosmology, and geography. Many of their youth spend up to twenty years acquiring it, by memorizing a vast number of verses. Up to this point, the Gauls’ system of education sounds like that of the Roman patricians: a grounding in the poetic corpus constituting what Havelock would call their “tribal encyclopedia,” a progression to more speculative areas of knowledge, a period of study abroad. Homer, Plato, Athens. Caesar’s imaginary hearer must be impressed by the figure of twenty years for a well-rounded Gaulish education. The first word of the next sentence (“Neque fas esse existimant…”) responds to possible objections to the previous sentence: not only do they spend twenty years in education (first surprise), but they do not even use writing for their voluminous sacred teachings (second surprise). The word “fas” suggests a divine or ritual prohibition, as if raising the seriousness of the interdict in response to the hearer’s amazement. Caesar then, using the first person for the only time in the whole of the Gallic Wars, ventures two explanations: the Gauls forbade writing their wisdom down either to keep it from falling into the hands of the undeserving, or to protect their memories from the decay initiated by the use of writing. Both these justifications are drawn from Plato’s Phaedrus, the dialogue where Socrates dismisses writing as a shortcut to wisdom; the analogy Caesar makes is quite the compliment to the Gauls. Here we have a division in two parts of the field of information among the Gauls: everyday business, where writing is permitted, and the realm of the sacred, where it is forbidden. By this interdiction oral tradition is marked out as the field of greater value. Unlike the failure to write, which could be ascribed to any barbarians, the Druids’ refusal to write puts their learning among mysteries that Caesar’s page—like any page—cannot contain. The reason for lingering on this passage is that Caesar imagines, in writing, a culture in which writing is not the normative member of the pair “writing-orality.” This surprising statement, coming from a writing man, would not often be seconded in the next eighteen hundred years. I will take my next cue from the recent book by my colleague Larry Norman, The Shock of the Ancient, which recounts the quarrel, in seventeenth-century Paris, between writers who maintained that the ancients were the sum of cultural attainment and the models for all time, and those who upheld the achievements of Louis XIV’s France—the “Moderns”—as unprecedented, indeed as outshining whatever the Ancients had done. Much of the controversy between pro-Ancients and pro-Moderns hinged on Homer. New translations had recently come out, and Homer began to appear in sharper focus than before; the awkward transitions, inconsistencies, disproportions, cruelties and crudities of his heroic epics were now in print for all to see. 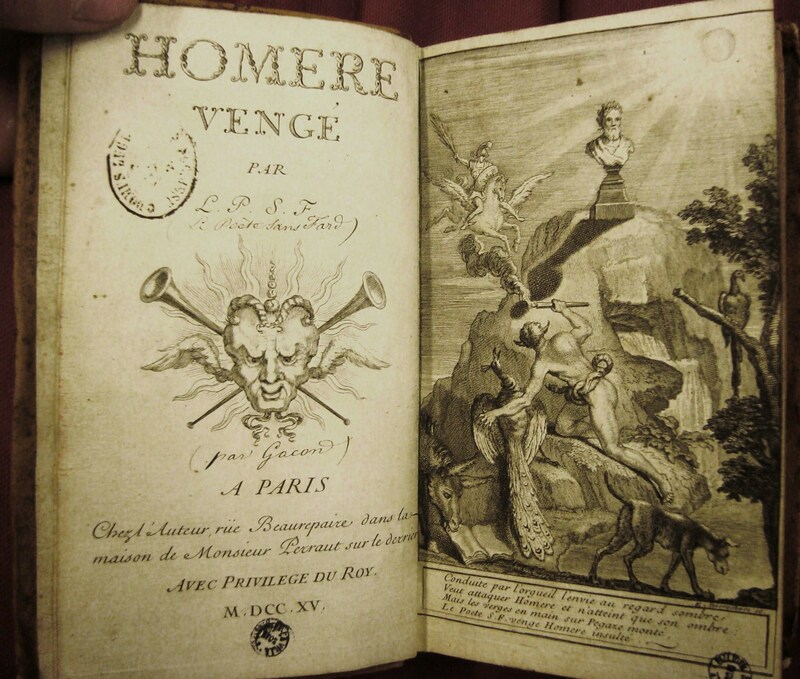 A secular cleric named François Hédelin, abbé d’Aubignac, wrote a pamphlet arguing “that Homer was not a good poet, and never even existed.” The Iliad and Odyssey were, according to d’Aubignac, “full of weaknesses and violations of common sense.” As Larry puts it: “Sloppy poem, sloppy poet.” The explanation of the epics’ flaws is to be found in the history of their composition, as the abbé reconstructs it: hymns celebrating the age of heroes, originally performed in princely courts, fell into the public domain and were sung by minstrels and beggars. Since these verses were common property, always in the mouths of low-class people and beggars, no one valued them, and no study came to improve this poetry: it was recited everywhere, even on the street corners, which could well have caused the dissipation of the work through negligence, or through contempt. Out of the débris of Homer’s reputation emerges a déclassé literary genre, the beggar’s monody. The fact that the Iliad and Odyssey might derive from orally circulated texts is, in d’Aubignac’s estimation, a good reason to disdain them, and all the explanation we need for their incoherence and poor taste. A self-aware age of “criticism” added the hypothesis of oral transmission to its repertoire of devices for purifying literary taste. Similarly, and almost at the same time, Biblical studies calls on a period of “oral transmission” of the Scriptures as a way of accounting for their otherwise incomprehensible variability and contradictoriness. In all this the constant factor is the assumption that oral poets are not really in control of themselves. Their memory fails them, they can’t plan ahead, they’re unoriginal, they are constitutionally incapable of producing finished, rational, classical work. And that is why we should drop the Ancients and embrace the Moderns. This position couldn’t be left without an answer. 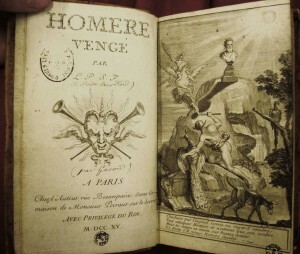 My whole presentation today could be covered with the title of a polemic dating some forty-five years after the initial salvos (showing how durable were its effects): Homer Avenged, by François Gacon, published in 1715. Homer’s rhapsodies and the songs of Ossian were both impromptus, because at the time nothing existed but impromptus; after Ossian came the Minstrels, however weakened and remote; at any rate they followed until Art came and extinguished Nature. … Look through the poems of Ossian. In all the circumstances of bardic song they are so similar to another people that is still living, singing, and performing deeds on the earth; in their history I see, without prejudice or illusion, the history of Ossian and his ancestors brought back to life more than once. I refer to the Five Nations of North America: death songs and war chants, battle songs and funeral songs, historical hymns to and about the ancestors…. When the Greenlander tells of his pursuit of seals, he does not recount, but paints with words and gestures every event, every movement, since all of these are parts of the image in his soul. And when he gives the eulogy and the farewell over a departed friend, he does not praise or lament; he paints, and the very life of the dead man, summoned up with all the force of imagination, must speak and shout. … [Example quoted at length.] The Greenlander follows the most precise rules of the elegy genre… and from whom did he learn them? The rules emerge naturally from the situation, rather than having to be learned from a manual. And if we were as careful to keep intact our experience and vision, and not to follow neoclassical precedents, we too might write with the vitality of Homer. Herder is writing in response to d’Aubignac and the pro-Modern faction—perhaps a little too exclusively in response to them to be a credible ethnographer of oral poetry. You see where this is going: toward the nineteenth century’s idealization of the Folk as the repository of true national identity, and of one’s own national culture as deserving to be defended and cherished against some so-called cosmopolitan ideal (usually French—but the French had their own secret stocks of local culture and belief to be shielded from the acquisitiveness of Parisian centralism). Such broad views of national and popular song put oral literature in a newly conspicuous place—indeed, on a pedestal. Folklore collectors, following the example of the Grimms, fanned out to document the customs and sayings of the people, each in their own country. A discipline of folklore grew up to connect the countryside with the libraries and academies. Jakob Grimm’s saying was widely quoted: das Volk dichtet, or “the people are the makers of their own poetry.” (He seems not to have said it in quite that way.) But the nineteenth century, if it starts out with liberations and enthusiasms, turns past its midpoint into the century of positivism, oh so dreary, and compilation of factual matter, preferably to be digested in tabular form and reissued as a law. Where has a Folk ever been seen to compose a poem? asked some of these reasonable later nineteenth-century people. And the answer came out of observation, imagination and analogy: as George Lyman Kittredge sketched it out in 1904, in “a small tribal gathering” “there is no such diversity of intellectual interests as characterizes even the smallest company of civilized men. There is unity of feeling and a common stock, however slender, of ideas and traditions.” Members of “a singing, dancing throng subjected as a unit to a mental and emotional stimulus” sing on the spur of the moment phrases that, summed up, make a song, chanted in refrain by the whole group. “A song made in this way is no man’s property and has no individual author. The folk is its author.” And things don’t stop there: as it is recited and bandied about it will, of course, change, whether through adaptation, misunderstanding, or augmentation. The process is not complete, however, until “the folk accept[s] the gift and subjects[s] it to that course of oral tradition which is… essential to the production of a genuine ballad.” So the ingredients then are: common sensibility under strong stimulus; individual utterance, repeated by a chorus; acceptance by a community of the production and its further circulation in a wider world, whereby it becomes truly common property. This model of folk production of poetry could be inflected in various ways. Various scholars insisted on one or another dimension of it: on the formulaic, repetitive character of the verses that composed a normal folk poem, or on its generality, as befitted a song that would be used in many different circumstances, like a mass-produced valentine. One German folklorist named Hans Naumann insisted particularly on the uniformity of the folkish mind: in a true Volk there could be no divergence of opinions, because a divided folk would be incapable of poetic production. He also seems to have doubted the creativity of this Volk, for, as he construed it, most folksongs were decayed and detached pieces of courtly poetry that had somehow fallen into the hands of the common people, who “reproduced,” not “produced” poetry by misunderstanding it and “singing it every which way.” You might recognize here the same model that had served d’Aubignac in 1664 for rejecting Homer as just another blind singer recycling snips and scraps overheard from noble courts. Naumann’s strongly dismissive views of the folk would make him an unlikely folklorist, and probably worthy of dismissal today, were it not that one of the most brilliant contributions to the debate on oral literature, Roman Jakobson and Petr Bogatyrev’s “Folklore as a Specific Mode of Creativity,” were not in large part directed against his theories. Jakobson and Bogatyrev—one a linguist, the other an ethnographer—bring to the discussion of folklore a new model taken from the structural linguistics of Ferdinand de Saussure. For them, the ambiguity and jelly-like character of the idea of oral poetry, the folk, and collective composition resolve once we put them in the framework of “langue” and “parole” devised by Saussure. Langue, or language, is a system of units and rules that makes communication possible; parole, or speech, is the individual act of communication that relies on that system. Thus the folk as a whole is the collective author of langue, a body of conventions so huge and so complexly interrelated that no single person could have made it up; and the random individual in the crowd who is moved to sing a verse using the words of the tribe is expressing himself in parole. But that is true of any act of speech, even the speaking I am doing in front of you right now. What singularizes folklore is that the parole of the individual speaker is then fed back into the shared consciousness of the group. It must be remembered and repeated in order to become an ingredient of common culture. And what the community as a whole is willing to remember is, by and large, what fits with their ideas of what is beautiful, right, just and good. An eccentric or overly individual act of speaking will fail to be understood; it will not be remembered; it will fall out of the vocabulary of the community’s folklore. Jakobson and Bogatyrev call this process of winnowing and forgetting “preventive censure.” The folk does compose poetry, we see; but it composes with scissors. Composition is not complete before circulation; circulation enacts composition; and composition-plus-circulation occurs with “considerations of representability,” as Freud said of the dream-thoughts as they pass through the internal censor’s filter. The authorship of the work of folklore is a kind of collaboration between the member of the community and the average of what everyone else can understand and retain. The cats, in short, herd themselves. Now some elements of this picture were already to be found in Kittredge, for example, who commented on the ballad in 1904 by saying that “We may compare the processes of language. A word is created by somebody. It then becomes the property of the whole body of those who speak the language. and is subjected to continuous modification from generation to generation.” But the understanding of what a language is—not just a collection of words, but a totality that in many ways organizes and balances itself independent of the will of any speaker—gives an extra force to Jakobson and Bogatyrev’s claim that “A fundamental difference between folklore and literature is that folklore is set specifically toward langue, while literature is set toward parole”—parole being the once-off, individual utterance. In literature censorship is fairly relaxed; in folklore we have “an inseparable fusion of censorship and work.” Like the dream in Freud’s theory, folklore is not simply mutilated by censorship, it is also partly created by it. The poet is “a special type of participant in poetic creation.” Further research will need to clarify the functions, limits, inner structures and rules of a given community’s folklore, exactly as if one were describing the grammar of a recently discovered language. Only here the language is built on top of an existing language, the language of ordinary communication. Here, then, oral poetry or folklore has really become a thing in its own right and not merely the symptom of the deprivation of literacy. On censorship and Jakobson and Bogatyrev’s essay there is something more to say. They emphatically reject Hans Naumann’s account of the “primitive cultural community” in which there is “no individualism… [all] are inspired by the same emotions and thoughts.” And of course they reject his theory that the content of folklore is used goods that have fallen off the truck of high culture. Now Hans Naumann was a powerful foklorist in Germany, and four years after the publication of Jakobson and Bogatyrev’s essay would both join the Nazi party and be chosen as rector of the university of Bonn. In his capacity as rector he ordered and supervised one of the first book burnings in Nazi Germany, casting on the flames hundreds of volumes that he described as “undeutsch,” un-German. Here is the primitive censure of the community, rejecting everything that is alien to it, carried out in the most clumsy and futile way under the conditions of book culture. Texts but no text: that sums up for me the vital interest of this field, where the works we should study (unlike the texts we can study) are virtual or potential, like the outcomes of a future game of which we only know some of the rules and some of the past matches. The scholars of orality who were fascinated by process were drawn to psychology, embodiment, gesture, the disciplines of enactment and performance. I say we follow them there. This entry was posted in Arts, Books, Culture, Language, Media, Memory, Uncategorized. Bookmark the permalink.